I recently read a description of a miscommunication between a major league starting pitcher and the team’s manager. Following the completion of the sixth inning, with ninety-nine pitches thrown, the pitcher assumed he was done for the day. The manager, however had other plans. This produced an embarrassing situation for the team and for the individuals involved. The article went on to explain that the previous manager had communicated with his pitchers regarding their removal from the game with a handshake or a pat on the backside. There was no doubt regarding that manager’s intent. Pitchers always knew where they stood. In baseball, some communication needs to be secret, yet clear. The catcher signals the pitcher regarding what pitch he wants thrown next and teams work hard to make sure the other team does not steal these signals. A base coach goes through a series of gyrations to communicate to the batter and the batter has to know which segment of this communication is important. On the other hand, some communication must be much more obvious to everybody. The umpires must clearly indicate whether a pitch is a strike or a ball, whether a hit down the line is foul or fair, and whether a base runner is safe or out. The game depends on everybody knowing. Changes to the lineup must be clearly communicated and players must be notified when they are being removed from or entering the game. Communication is an important element of leadership and there is a balance between over-communicating and under-communicating. It is our responsibility as school leaders to ensure students, families, and especially staff members have the information they need, without overburdening them with too much information. An important aspect of a leader’s job is to ensure everybody has the information they need to be successful. We must also know when and how to maintain appropriate confidentiality. The baseball story has me thinking about how communication can be improved at my school. Are there routines (similar to the handshake between manager and pitcher) that we can incorporate to enhance understanding? How can we ensure messages are received in the manner intended? What additionally can be done to avoid miscommunication? What more can we do to put staff and students in position to act with confidence, knowing their actions align with expectations? How can two-way communication be enhanced? What opportunities can we create to ensure all stakeholders are heard? How can we ensure the right people have the right information at the right time? Lack of communication in the school setting may not be as easy to notice as what happened in the baseball game when the pitcher did not show up to pitch, but careful consideration regarding how we communicate can help us to ensure the school is operating at its best. What can be done to improve communication in your school or classroom? 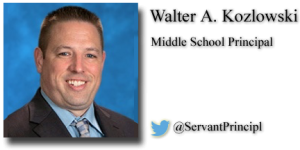 Walter A. Kozlowski, Ed.S is Middle School Principal. 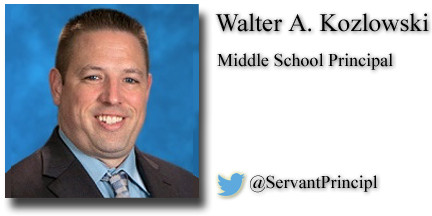 He shares his insights on his website, Servant Principal. Follow Walter on Twitter at @ServantPrincipl.